The Lot Fee (sometimes also known as "PAC") is an amount that represents an estimated overhead cost for maintaining a vehicle on the lot. The Lot Fee is similar to PAC, but is added when the vehicle is entered into inventory rather then after the vehicle is sold. The Lot Fee does not affect the General Ledger. 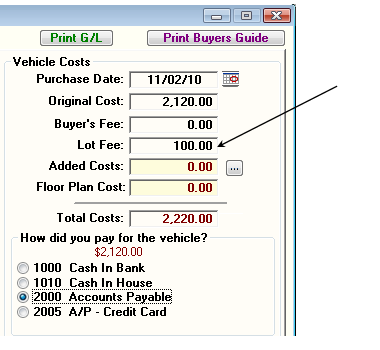 The General Ledger will indicate that the vehicle costs $2,120.00, not $2220.00. Frazer defaults the Lot Fee to $100.00. To edit the default amount, go to Miscellaneous, 1 - System Options, then 5 - Vehicle Options.